First of coat paint now going on. Looks like blue is in. Wonder if the pink will make an appearance again? It looks Beautiful all blue lets celebrate that its still with us, Henry Elder would have been proud, long may it be with us. Looks great! I hope they do an open day some day, I’m going to write an article about it at some point and I’d love to get inside. One of my favourite buildings in Manchester. I’m absolutely delighted to see all this work which is being done on the Essoldo. This theatre/cinema is absolutely stunning. I look down on the rear of the building every day when walking over the bridge from Chorlton and it looks to be in superb condition. The main shell/frontage speaks for itself. This beauty needs to be listed asap! <> Once buildings like this are gone, they’re gone forever. I’m glad the owner cares about it. It needs to be restored/preserved and I’m delighted that it’s starting to look pretty again. A glorious example of art-deco architecture. The location of this place is fab, it’s really exposed on a major road/junction for everyone to enjoy. Hundreds of thousands of people will go past here every week. How amazing would it be if the Essoldo was re-opened as an entertainment venue. Imagine how cool it would be seeing a concert, stand-up comedy act or theatre production there! It’s right next to Stretford Train station. It hits 101 different bus routes, there’s parking across the road. The Essoldo has potential inside as I’ve seen from your video. The internal structure, dimensions, size and layout look brilliant. 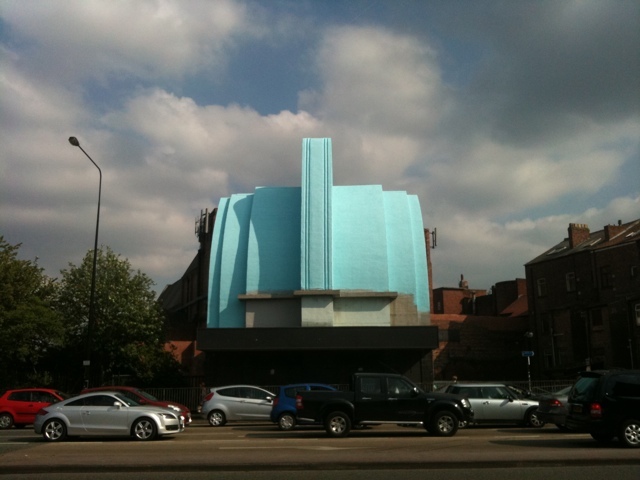 I really hope something comes of this, South Manchester could have one of the finest examples of an art-deco cinema in the country. A true landmark. It deserves to be saved. my husband Peter went to the Longford in the first week it opened…It was for children that didi’nt have a father. In he went with a orange and a bag of sweets,all free and had a wonderful time…as he remembers the Lord Mayer was also their…..I spent my childhood and teenage years their,I remember the double seats in the cinema very well…. I hope it re-opens as a cinema,as people these days all seem to go to the pictures and love it like we did…Oh the memories ! ! ! ! regards Rita Diggle..Bowdon..Altrincham..